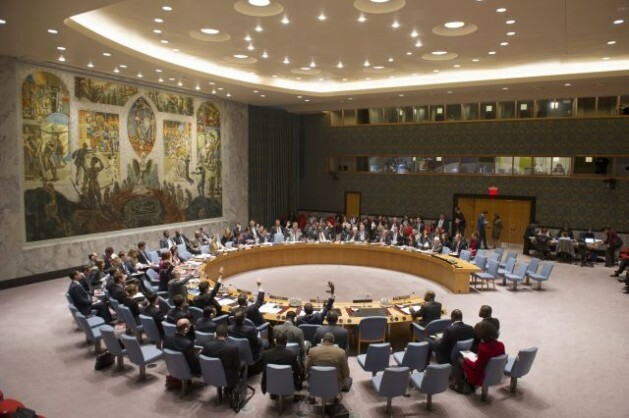 UNITED NATIONS, Jul 14 2014 (IPS) - When the 15-member Security Council, the most powerful body at the United Nations, fails to resolve a military conflict, it invariably exercises one of its tried, and mostly failed, options: punish the warring parties by imposing punitive sanctions. Currently, there are 15 U.N. sanctions committees, supported by 65 “experts” overseeing 11 monitoring teams, groups and panels, at a cost of about 32 million dollars a year. There have been no takers so far in a sharply divided Security Council, mostly with vested political and military interests in the Syrian civil war. The sanctions, imposed so far on about 25 countries, have included arms embargoes, travel bans and financial and diplomatic restrictions. U.N. military sanctions go back to apartheid South Africa in 1977, and since then, have been imposed on several post-conflict countries, including Iraq, Iran, Somalia, Libya, Ethiopia, Eritrea, Liberia, the former Yugoslavia and the Democratic Republic of Congo (DRC). Last month, Secretary-General Ban Ki-moon publicly called on the Security Council (UNSC) to impose an arms embargo on Syria. But there have been no takers so far in a sharply divided Security Council, mostly with vested political and military interests in the Syrian civil war. Ban has persistently – and unyieldingly – maintained that the ongoing civil war in Syria, which has claimed over 150,000 lives since March 2011, could be resolved only politically, not by military force. But his voice is lost in the political wilderness – with no diplomatic or moral support either from the United States, Western Europe, Russia, Qatar, Egypt, Saudi Arabia or the United Arab Emirates (UAE) – all of them explicitly or implicitly providing military or financial support to the warring parties in Syria. The United States, Britain and France could possibly opt for military sanctions – but only on Syrian military forces. Russia and China, who are supportive of the Bashar al-Assad regime, want sanctions on Western-supported rebel forces. As a result of the deadlock, the proposal for an arms embargo has remained grounded. The secretary-general’s proposal took another beating late last month when the United States announced plans to spend about 500 million dollars to train and arm “moderate” Syrian rebels – making the proposed arms embargo a mockery. “Considering the deadlock over Syria in the past few years, the call by the secretary-general is not likely to change anything,” Pieter Wezeman, a senior researcher at the Arms Transfers and Arms Production Programme at the Stockholm International Peace Research Institute (SIPRI), told IPS. Russia has been very outspoken about its opposition to an arms embargo, backed by China, both veto-wielding permanent members of the UNSC, he pointed out. “This has been related to the widespread view in Russia that the end of the Syrian regime (of President Bashar al-Assad) will lead to chaos and fundamentalism in Syria,” Wezeman said. On top of that, he said, Russia has repeatedly pointed at the experiences of the conflict in Libya, when several states provided weapons to Libyan rebels legitimising this, and using ambiguous language in UNSC resolutions, that Russia thought imposed a full arms embargo on Libya when it agreed with the resolutions. Russia has stated repeatedly that an arms embargo is out of the question if there are no convincing guarantees that states will stop supplying weapons to the rebel forces opposing Assad’s regime, said Wezeman, who has been closely tracking military developments in Syria. Currently, Russia is the major arms supplier to the Assad regime. There is also the question of the effectiveness of sanctions, because the United Nations does not have the means to rigidly enforce any arms embargoes, according to U.N diplomats. William Hartung, director of the Arms and Security Project at the Centre for International Policy, told IPS the secretary-general’s call for an arms embargo on all sides of the Syrian war is a welcome effort to reduce the bloodshed there. The biggest impact would be stopping the flow of Russian arms to the Assad regime, but unfortunately, Russia is also the country most likely to veto any embargo proposal that comes before the Security Council, he noted. “So the question will be how to pressure Moscow to reverse course on its military support of the Syrian government, or whether an embargo by the U.S. and the European Union (EU) only would have the desired effect,” he said. Still, U.N. Deputy Secretary-General Jan Eliasson said the UNSC has been using both economic and military sanctions with increased regularity since the mid-1990s. “We know that sanctions can work when they are designed and implemented well and when they enjoy the support of member states on and outside the Security Council,” Eliasson said. Speaking at a high-level review on sanctions last month, he said in almost all of the 25 cases where sanctions have been used by the U.N., they have been part of an overarching strategy featuring peacekeeping, peacemaking and peacebuilding elements. Some sanctions regimes are designed to support governments and regions working towards peaceful transition, he pointed out. In Libya, sanctions continue to help transitional authorities recover state assets and prevent the proliferation of small arms and light weapons. In Liberia, the arms embargo on non-state actors continues to provide the government with protective support. In Guinea-Bissau, he said, the sanctions regime is acting as a deterrent against post-electoral violence by encouraging key local actors to respect the results. “Steps are also being taken to assist peaceful and benign governments whose countries are still under sanctions,” Eliasson added. Meanwhile, the secretary-general recently dispatched an assessment mission to Somalia to explore how the United Nations and others can help the federal government comply with the partial lifting of the arms embargo, he said. Hartung told IPS past embargoes have been imperfect, but have been worthwhile nonetheless. The embargo on the apartheid regime in South Africa was violated through third party transfers and undermined by sales of arms-making technologies to Pretoria, but it did reduce the flow of arms to South African forces and it made it more expensive for South Africa to maintain its war machine. He said arms dealers like Viktor Bout, in collaboration with key governments, undermined embargoes on Sierra Leone and Angola, but a more forceful and coordinated effort to stem this trade could have made a difference. “So it really comes down to the political will of key governments to make embargoes work,” he concluded. Even when they aren’t perfect, he said, they can make it harder for parties to conflicts to arm themselves and therefore reduce levels of violence. Since the early 1990s, Wezeman told IPS, there have been around 25 separate U.N. arms embargoes. Quite certainly all of these have been violated to some extent. However that should be expected from any sanction imposed by the U.N., or even any sanction or law imposed in general. “Still, most if not all of them have made it considerably more difficult for the targets of the embargoes to continue to acquire weapons,” he said. Obviously more is needed to end wars, he said, as often large stocks of weapons will still be available to continue fighting. However, not imposing an arms embargo can be argued to make things even worse, Wezeman added.